Thousands of authors have written billions of books, and we keep seeing a stream of books on shelves on a daily. Humankind fancy reading because in those very words there is wisdom, a lesson to learn and perhaps something new to know. The most expensive books in the world don’t have the price tag because of their initial sales label, and even if they would, that wouldn’t be a reason good enough. Their storylines are better, and every description in each book is perhaps the kind you have no read for a long time in the history of writing, making them perfectly fit in the most expensive category. Written by Leonard Da Vinci, there was only one copy of the book in the entire human history. 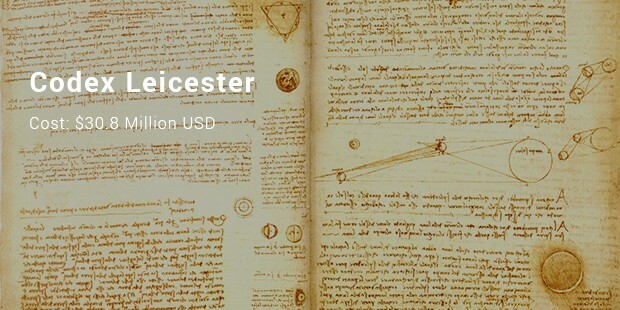 Leonard’s work ages back to the late 1500s However, we see the book sells to the willing buyer just recently. The book was sold in November 1994 as the only original and actual copy of the book. The Latin book written in the 7th century A.D is also known as the Stonyhurst Gospel and it goes with another name – St. Cuthbert Gospel of St. John. 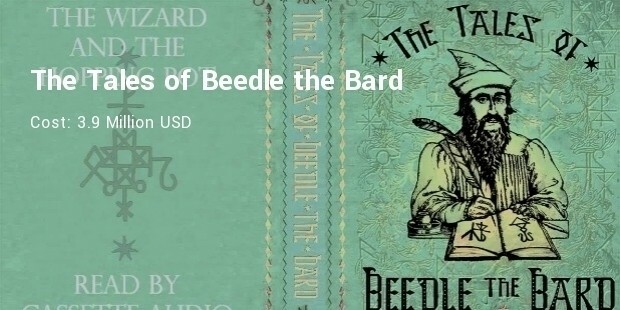 The British Library auctioned the book in the year 2011 as a part of their fundraising campaign and the book was announced to be sold for $15.1 million USD. The book has a great historical significance, for it is the first book to be printed in British North America in the year 1640. Through the ages only eleven copies of the book survived and in a 2013 auction and David Rubenstein owned the book with intentions to “loan the book” to several libraries across the country. 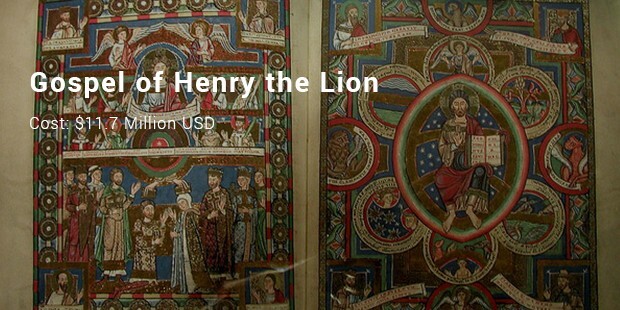 The book with four illuminated gospels made for the Duke of Saxony – Henry the Lion has 266 pages and 50 of them being illustrations was put to auction in the year 1983. 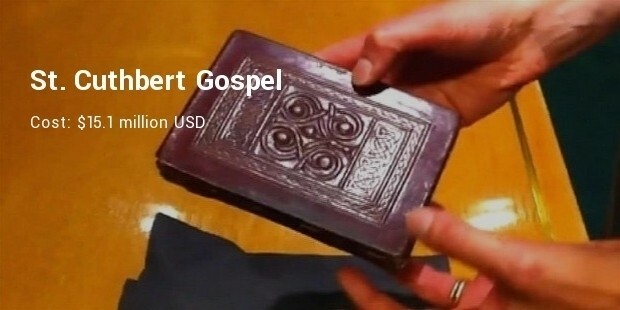 The German Government, in order to preserve their historical heritage bought the Gospel. This book was originally printed out in the year 1974. 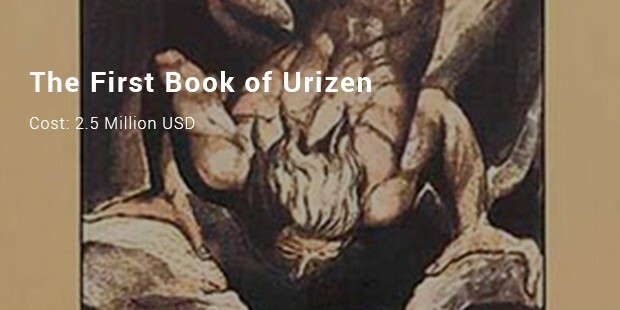 William Blake was the founder of this book, and it formed an important part in his series of books of prophecy. Only one copy from the ones that survived were sold at a price of 2.5 million dollars to a certain private collector at Sotheby’s New York in the year 1999. 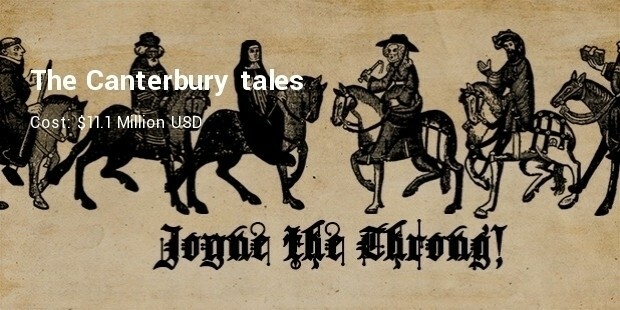 The book, without which there wouldn’t have been an enriched English language today, is written by Geoffrey Chaucer – The father of English poetry. William Caxton printed the book in 1477 and only twelve copies survived. Out of them, one was put to auction and few London merchants got it for $11.1 million USD in the year 1998. After the death of William Shakespeare, his plays were published by Henry Condell and John Heminges in the year 1623. 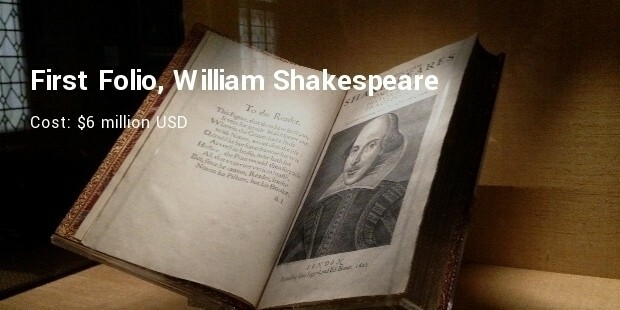 The book possesses the most authentic phrases of Shakespeare and includes 36 plays and only 40 editions survive. One of the copies was bought by an anonymous individual in 2001. The book is credited for being the first one with movable type printing and was printed by Gutenberg somewhere around the 1450s. 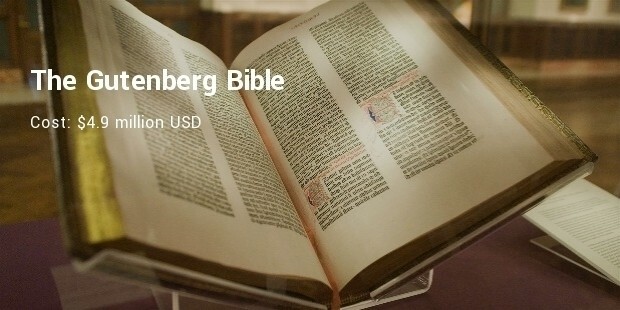 Also known as the 42-line Bible, the book has only 48 copies in existence and in the year 1987 “The Gutenberg Bible” was sold at Christie’s New York. 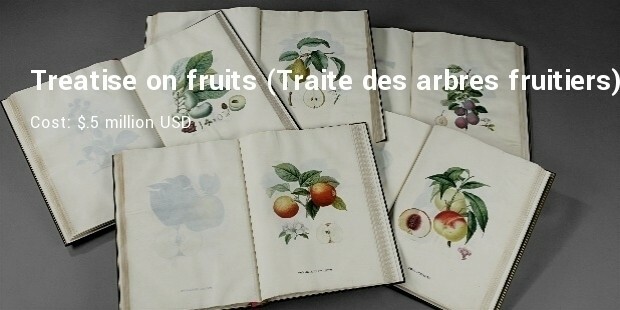 The book was written by Henri Louis Duhamel du Monceau after doing an extensive research on fruit trees. The illustrations were drawn by Pierre Antonie Poiteau and Pierre Jean Francois Turpin. 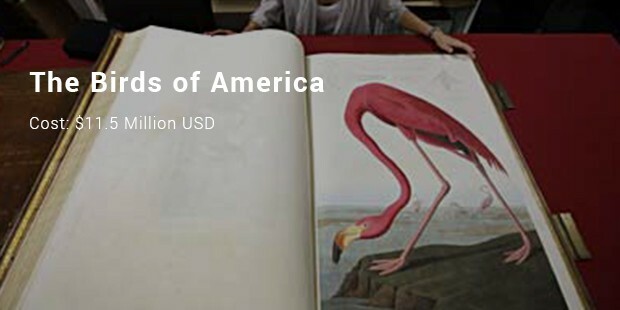 The book consists of five volumes and was last auctioned in the year 2006. 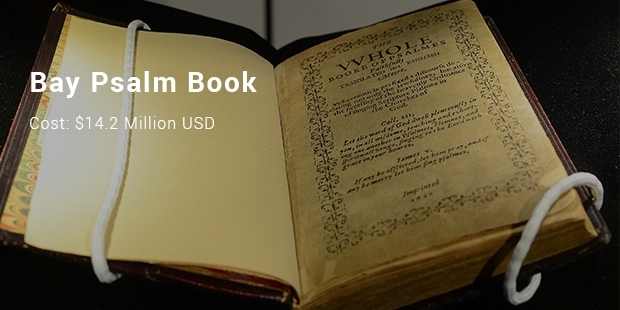 This is the world’s first book to have the use of engraved illustrations in it. 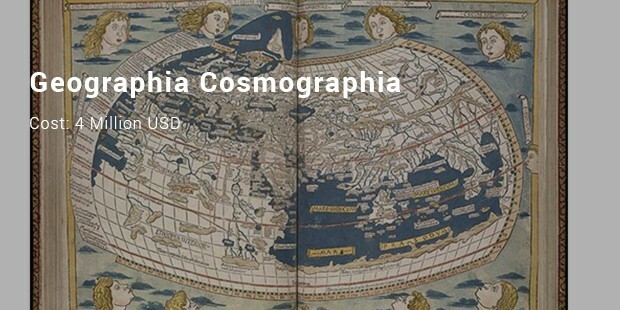 It is still the world’s first printed atlas. It was sold at Sotheby’s London in the year 2006 at a price of 2,136,000 euros which when converted into dollars will add up to 4 million. This book focuses more heavily on Deadly Hallows and harry potter hence making the book a children’s book. Perhaps being a kids’ based book explains why it became a mass-market paperback. J.K Rowling, the writer of the book, was able to create copies that were in twos, each of them being handwritten. Later six of this book’s copies were handed out to editors and friends. Years later on of the copies was auctioned to Amazon.com for a complete 3.98 million dollars. It is true to say that through studying books you’re able to be familiar with things. Always try to purchase books in order to get to study. Today, there are books of many kinds. The ones above are just the top most expensive ones. In addition, the featured books are also of high moral value and so, as your child gets to read, he or she might start working on his or her behaviors.